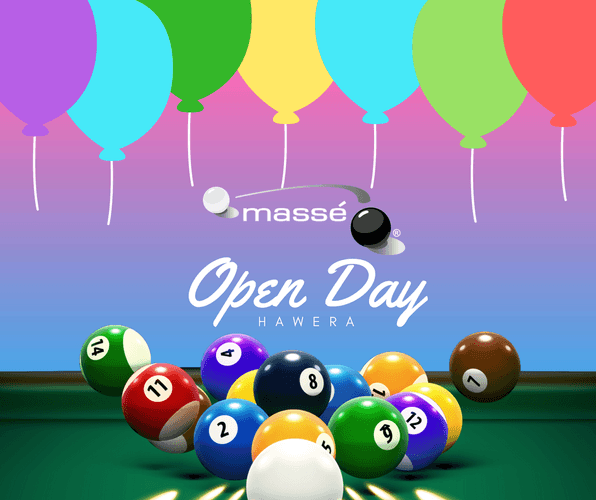 We’d like to invite you to the Massé Hawera Open Day! Takes place on Sunday 20th May 10am – 3pm! Bring your friends and family along to play pool for free with the chance to win some awesome spot prizes! We’ll have a sausage sizzle, goodie bag giveaways and lots of fun games. Come for a day full of fun for everyone. For those of you who don’t know who we are, we’re are a not-for-profit club that offers a range of facilities and activities for members including cue sports and recreational equipment and products. Our Club provides a safe and welcoming environment for its members across the Waikato, Franklin, Auckland and Taranaki regions. We strive to make Massé Club a fun place for our members to achieve the level of skill that they aim for. No matter whether our members play socially or competitively, we endeavour to have the best possible resources and support. As a member of Massé you have access to all Massé Club branches in Hamilton, Pukekohe, New Lynn and Glen Eden. In each of these Clubs you’ll find the best resources you need to play the game you love, whether it be 8 Ball, 9 Ball, 10 Ball, Snooker, or Billiards. You also have access to free cue sports coaching! If you’re interested in joining our club come in and we’ll give you a tour!